This book describes the concepts and application of model-based development (MBD), model transformations, and Agile MBD to a wide range of software systems. It covers systems requirements engineering, system specification and design, verification, reuse, and system composition in the context of Agile MBD. Examples of applications in finance, system migration, internet systems and software refactoring are given. An established open-source MBD technology, UML-RSDS, is used throughout to illustrate the concepts. The book is suitable for industrial practitioners who need training in Agile MBD, and those who need to understand the issues to be considered when introducing MBD in an industrial context. It is also suitable for academic researchers, and for use as text for undergraduate or postgraduate courses in MBD. 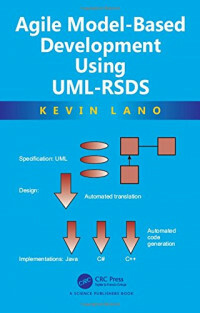 Examples for educational use of UML-RSDS are included in the book.